Home » How to Connect Proximity Switch (Source Type) to Make LED ON ? An improvement over direct-contact limit switches for many applications is the inductive proximity switch. This type of switch actuates simply when an object gets near it – no direct physical contact necessary! Explain how these devices work, and what kinds of material they are able to detect ? 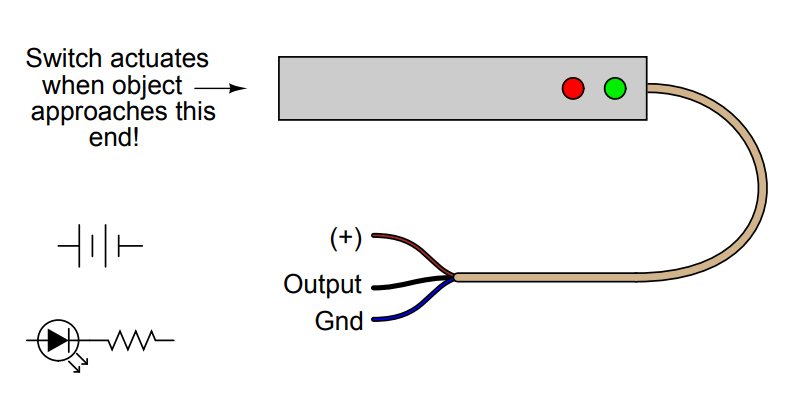 Show how you would connect the switch in the above illustration so that it makes the LED turn on when actuated, assuming the switch’s internal transistor is configured to source current through the output lead.